The hydrologic cycle describes the natural circulation of water through our atmosphere, surface and subsurface. During the cycle, water undergoes natural transformations. Water will fall from the atmosphere in the form of precipitation and land on the surface. Some of this water will remain on the surface and drain into rivers and lakes, while another portion will soak into the ground or be absorbed by plants and the remainder may evaporate back into the atmosphere again. Initial water seepage entering the subsurface goes into the unsaturated or vadose zone, which has mix of air and water. Some of this water will be taken up by roots or will coat the soil, but the remainder will continue through to the saturated zone, which is the entire region below the water table, contributing to recharge of localized aquifers. 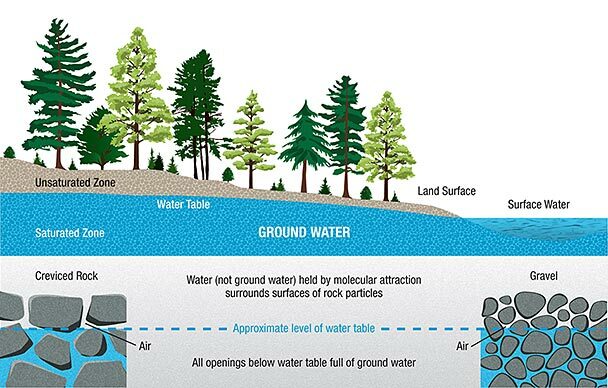 Groundwater exists almost everywhere below the surface. Most subsurface fresh water sources are found in the shallowest unconsolidated horizons lying at depths ranging from 0-150 metres. Geologic strata that contain significant amounts of moveable water are called aquifers. Aquifers can carry fresh, brackish or saline water. Formation or ground water quality is often described by its Total Dissolved Solids (TDS) concentration. The TDS unit of measurement is either milligrams per litre (mg/l) or parts per million (ppm). Provincial and Territory regulations ensure that shallow potable groundwater is protected during the extraction of oil and gas. This is achieved by providing guidance to best practices for drilling a well, including well casing and cementing, and other requirements that may include setbacks to maintain a specified distance from existing domestic water wells. When a well is drilled, steel casing is cemented into place and pressure-tested to ensure that fluids will not migrate into water wells. When the well is no longer needed, for example, because the gas has been produced, the well is plugged with dense, impermeable cement across all porous rock formations, the casing is cut off at least one metre below ground level, and the well is capped with a three metre cement plug and a steel plate welded in place to seal it completely. A vented cap is used in Alberta at abandonment to improve long term surveillance of post abandonment well integrity. Although there can be exceptions formation waters increase in salinity with depth and become unsuitable for either domestic or agricultural use (< 4,000 ppm TDS). The deeper the formations are, the more likely they are to become higher in TDS and can be quite saline. For example, in the north eastern region of B.C., most bedrock formation waters range from 20,000 ppm to as high as 200,000 ppm TDS. As such, the produced water from oil and gas operations is not considered to have a beneficial use for domestic or agricultural purposes, although they are commonly used to enhance oilfield production.